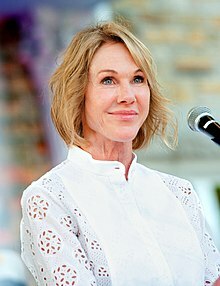 Kelly Knight-Craft (born February 24, 1962) is an American businesswoman, Republican donor, and diplomat. She has been confirmed to serve as the next United States Ambassador to Canada. In 2007, she was appointed by President George W. Bush as the U.S. delegate to the United Nations, where her focus included U.S. engagement in Africa. Knight-Craft was a delegate to the 2016 Republican National Convention from Kentucky. She is a member of the University of Kentucky's board of directors. She heads Kelly G. Knight LLC, a business advisory firm based in Lexington, Kentucky. In June 2017, Craft was nominated to serve as United States Ambassador to Canada by President Donald Trump. On February 22, 2019, President Trump nominated Craft to be the U.S. Ambassador to the United Nations. After two divorces, she is now married to a coal entrepreneur. During her first week as Ambassador to Canada she suggested that man-made climate change was just one possible theory. ↑ "Ten Nominations Sent to the Senate Today". whitehouse.gov. 2017-06-15. Retrieved 2017-06-28. ↑ Greenwood, Max (March 1, 2017). "GOP fundraiser Kelly Knight Craft to be ambassador to Canada: report". The Hill. Retrieved March 1, 2017. ↑ Dale, Daniel (March 1, 2017). "Donald Trump chooses Republican fundraiser as ambassador to Canada, Bloomberg reports". Toronto Star. Retrieved March 4, 2017. ↑ "PN603 — Kelly Knight Craft — Department of State". U.S. Congress. Retrieved 2017-08-06. ↑ 5.0 5.1 "Trump nominates Kelly Knight Craft as the next ambassador to Canada". BBC. June 15, 2017. Retrieved 9 August 2017. ↑ ELLIS, RONNIE. "Bush nominates Knight for UN". Glasgow Daily Times. Retrieved 2017-06-18. ↑ Latek, Tom (June 14, 2017). "Kelly Knight Craft is Trump's pick to serve as US Ambassador to Canada". Kentucky Today. Retrieved 9 August 2017. ↑ realdonaldtrump (2019-02-22). "I am pleased to announce that Kelly Knight Craft..." (Tweet). Retrieved 2019-02-22. ↑ "New U.S. ambassador to Canada Kelly Craft says she believes 'both sides' of climate science". www.cbc.ca. This page was last changed on 22 April 2019, at 08:02.